One of the most popular recipes for entertaining guests is the cheese ball. Cheese balls originated in the 1800s but really gained popularity in the 1940s. The reason for this is that they were relatively inexpensive to make, which during wartime was important to the frugal hostess. Eventually, the cheese ball sadly developed a negative reputation due to it’s “lack of class”. Fortunately for cheese lovers, the stigma doesn’t really hold true today and cheese balls are regaining popularity among the Pinterest crowd because of their variety and ease. We’ve been wanting to create a cheese ball for a while but needed some inspiration. When we received some samples of Pasta Chips we wanted to create a recipe with them. 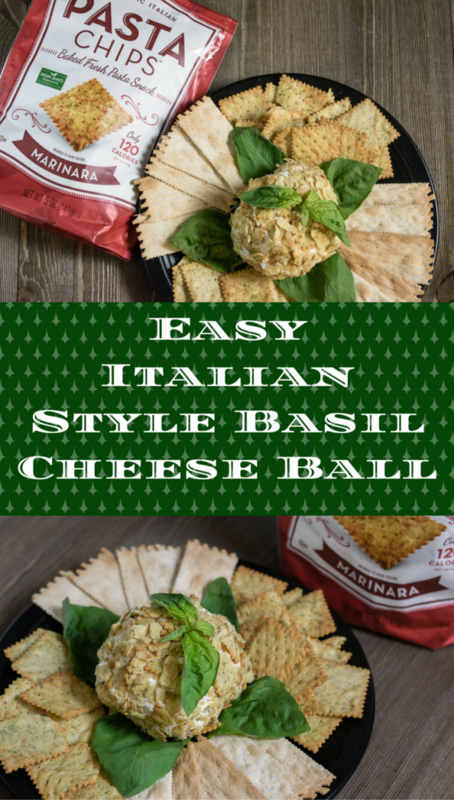 After trying the Marinara Flavor, we decided that a cheese ball with basil and Italian cheeses would be perfect! Mozzarella, Pecorino Romano, and fresh basil create the perfect pairing with the Marinara Pasta Chips. Do you have a favorite cheese ball recipe? What about a recipe that uses Pasta Chips? We’d love to hear all about it! Leave a comment below or use the hashtag #GeekEats! Roll ball in Pasta Chip coating. Serve with remaining Pasta Chips. *The Geeks received samples of Pasta Chips for review and decided to use a portion as part of this recipe; All opinions are wholly our own. View our Disclosure Policy for more info. I am so glad to see the resurgence of cheese balls. I’ve always loved them. Those chips sound super. I’ll look for the in the local stores. This post is a great idea for Super Bowl Sunday in 3 days! This looks sooo good! 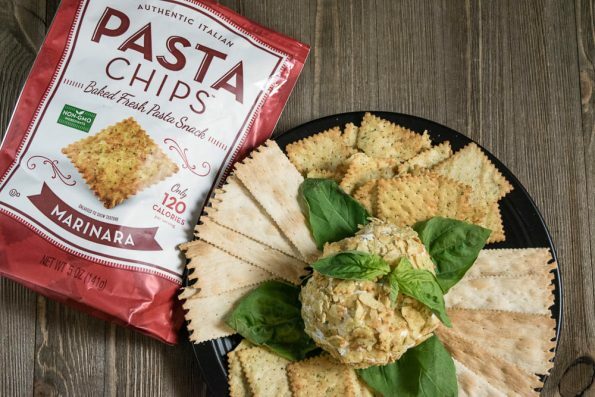 Can never go wrong with a cheese ball and I love these pasta chips – yum! Yes cheese balls (and dips) are great for entertaining. Well…cheese in general is popular on the appetizer plate in many forms. This cheese ball sounds flavourful, and would please a crowd for sure. I remember them from the 70’s they were a big party food. Mmmm, cheese, cheese, cheese and basil, yes! Great cheese ball recipe, this makes me think of pizza. Pinning.